Knoa partners with system integrators with a global reach, who have industry-specific knowledge and expertise. IBM is a leader in the invention, development, and manufacture of the world's most advanced information technologies. IBM translates those technologies into value for its customers through its professional solutions, services, and consulting businesses worldwide. IBM is a value-added consulting partner with KNOA. 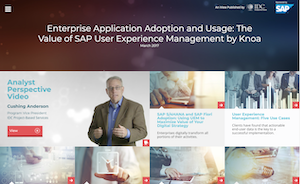 Knoa uses IBM Cloud as its hosting platform for the SAP UEM by Knoa cloud subscription service. Tech Mahindra provides innovative services, platforms, products, solutions and reusable assets across a number of technologies to deliver tangible business value to stakeholders. Tech Mahindra is winner of Forbes 2014 Asia Fab 50, Deloitte Tech Fast 50, the CIO 100 among other awards. Tech Mahindra is a 3.7 billion company with 103,200+ professionals across 90 countries, helping 750+ global customers including several Fortune 500 companies. Wipro Ltd is a global information technology, consulting and outsourcing company with 150,000-plus employees serving clients in 175-plus cities across six continents. Wipro helps customers do business better by leveraging our industry-wide experience, deep technology expertise, comprehensive portfolio of services and vertically aligned business model. Our 55+ dedicated emerging technologies ‘Centers of Excellence’ enable us to harness the latest technology for delivering business capability to our clients. IDC and SAP brochure: Enterprise Application Adoption and Usage: The Value of User Experience Management. Knoa Software provides software and services to help global organizations identify how people and processes are supported by their enterprise software solutions – increasing technology adoption, user engagement and delivering business value.